If I was only the first two, I might be inclined to say this is one of my new favorite movies of all time. It is delightful, adorable, whimsical, hilarious, creative, and the perfect amount of weird. It is so incredibly Roald Dahl and so incredibly Wes Anderson at the same time that the fangirl in me wants to do cartwheels over it. But, I'm also a feminist. And especially after just spending the last two weeks teaching college undergrads in my Women's Studies 101 class all about the representation of female characters in pop culture, hitting on everything from The Smurfette Principle to the Bechdel Test, I can't help but be a little devastated that this movie completely and utterly 100% drops the ball when it comes to female characters. If you go see it, you'll know what I mean. It's just disappointment after disappointment, and when there's a tiny glimmer of hope in one or two spots, the rug is immediately pulled out from under any possibility of redemption. I guess Dahl is partly to blame, since the original book didn't have much in the way of female characters, either. But if you look at his body of work, plenty of his stories have interesting and adventurous female characters. (Matilda and the BFG are two of my favorites.) I'm more disappointed that Anderson, in building an entire full-length feature around a short children's story and in interpreting and developing Dahl's characters and creating characters of his own, didn't think give a second thought to girls. What's funny is that if this had been one of Anderson's regular live-action films, I wouldn't have been surprised or let down by its failure to inspire my inner-feminist. I never necessarily expect that from him. But you know as well as I do that this film is different, because unlike Rushmore and unlike The Darjeeling Limited, children are inevitably going to see this movie. There were lots and lots of kids at the sneak preview, and I'm sure there will be lots of lots of kids who will see this movie, and even though everyone seems to think that ANIMATION = CHILDREN'S FILM, if I had kids, I wouldn't let them see it. It's not good for girls, who will be disappointed yet again that they only get to see themselves as housewives, caregivers, and love interests, and it's not good for boys either, for whom it will be reinforced that action and adventure are for them only. "I guess Dahl is partly to blame, since the original book didn't have much in the way of female characters, either." Not having read the book or seen the movie, I can only go by what you've written here. If the original book didn't have much in the way of female characters, do you think they should have created new ones wholesale? Or dramatically changed the roles of the existing female characters? Either would have brought a better balance, but would it have been appropriate? That's a good question, since I know I didn't elaborate much about what I thought was problematic about this film. I guess what bothered me is that Anderson had to take a LOT of liberties in order to expand this film. 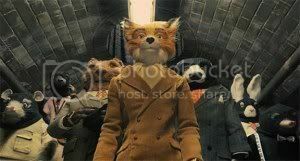 He replaced Mr. Fox's four unnamed (seemingly both female and male) children with one son and one male cousin, and he invented a whole batch of new male characters. Mrs. Fox is sort of a feisty character, but she's made out to be a traditional housewife, shown cooking and vacuuming, and at the one point where you think she might "save the day", she gets pushed aside and acts afraid while the male characters finish her fight. There's also a female romantic interest character for the young boy foxes, but her only function is to provide tension and jealousy between them. I was just disappointed overall. I love Dahl, but as a friend said... the money for the script wen to pay for Clooney. I am sorry but the movie is just... animated version of Ocean's dozen. I'm glad you mentioned the part about Mrs. Fox being pushed aside in that would-be heroic scene, because I tooootally didn't think about it from a female point of view. I was disappointed when all of her chain-snapping turned out to be for naught, but I actually thought it was funny when the movie didn't do what I thought it was going to. On second thought, it would've been much better had one of the male characters been in the fight and had she unexpectedly come to the rescue. The one thing this movie did with Mrs. Fox was show her to be the voice of reason when it came to making Mr. Fox change his way of life. However, his carousing was glorified, so her voice of reason got lost. Yiiiikes. Thanks for noticing my title typo. I can always count on you.